Two kids with the same name lived in the same decaying city. One went on to be a Rhodes Scholar, decorated combat veteran, White House Fellow, and business leader. The other is serving a life sentence in prison. Here is the story of two boys and the journey of a generation. In December 2000, the Baltimore Sun ran a small piece about Wes Moore, a local student who had just received a Rhodes Scholarship. The same paper also ran a series of articles about four young men who had allegedly killed a police officer in a spectacularly botched armed robbery. The police were still hunting for two of the suspects who had gone on the lam, a pair of brothers. One was named Wes Moore. Wes just couldn't shake off the unsettling coincidence, or the inkling that the two shared much more than space in the same newspaper. After following the story of the robbery, the manhunt, and the trial to its conclusion, he wrote a letter to the other Wes, now a convicted murderer serving a life sentence without the possibility of parole. His letter tentatively asked the questions that had been haunting him: Who are you? How did this happen? That letter led to a correspondence and relationship that have lasted for several years. Over dozens of letters and prison visits, Wes discovered that the other Wes had had a life not unlike his own: Both had grown up in similar neighborhoods and had had difficult childhoods, both were fatherless; they'd hung out on similar corners with similar crews, and both had run into trouble with the police. At each stage of their young lives they had come across similar moments of decision, yet their choices would lead them to astonishingly different destinies. Told in alternating dramatic narratives that take readers from heart-wrenching losses to moments of surprising redemption, The Other Wes Moore tells the story of a generation of boys trying to find their way in a hostile world. This is a compelling story told with passion and understanding. While the author is compassionate, he also makes clear that he is in no way excusing the other Wes Moore for his heinous deed. Wes Moore is a Rhodes Scholar and a combat veteran of Afghanistan. As a White House Fellow, he worked as a special assistant to Secretary Condoleezza Rice at the State Department. He was a featured speaker at the 2008 Democratic National Convention, was named one of Ebony magazine’s Top 30 Leaders Under 30 (2007), and, most recently, was dubbed one of the top young business leaders in New York by Crain’s New York Business. He works in New York City. I found this textbook to be one that gets to the heart of what divides this country and the generations. Wes Moore shows us clearly the lessons to be learned about the youth of today and difficult pressure placed upon them. It also shows how a person can change their destiny through hard work and the love of family, community and self. How important it is for parents make at time the difficult and unpopular decisions, to be a parent not a friend and the importance of personal responsibility. Pride and self-esteem must be earned. Praise to the author and his family for their love and to the Other Wes Moore for his insight into his decisions and how coming to terms with them can heal a soul and prayers for the officers' family and friends for their pain and grief which I sure still haunt them today. 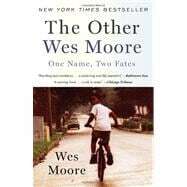 The Other Wes Moore: 5 out of 5 stars based on 1 user reviews.